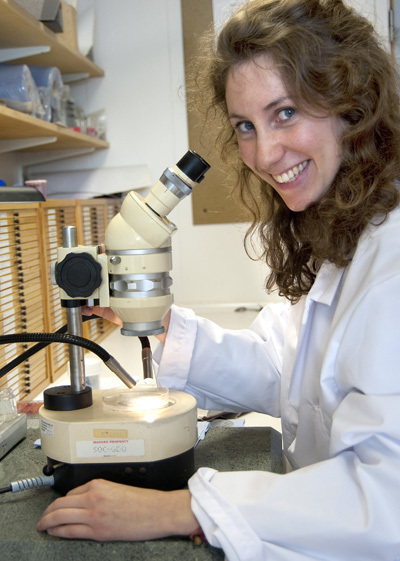 Laetitia Gunton is a Chadwick Biodiversity Research Fellow at the Australian Museum, Sydney. The tallest mountain on earth is a seamount. Hawaii’s Mauna Kea seamount is more than 10,000 metres from the base to the summit. In comparison, Mount Everest stands a mere 8850 m above sea level. While the number of seamounts in the world's oceans is debatable, (see Malcolm Clark's blog for that discussion) we know for sure that they provide a vast expanse of prime real estate for an incredible diversity of marine animals to set up home in. This Investigator voyage, IN2018_V06, is surveying some of these impressive underwater mountains off the coast of Australia. Importantly for my research, seamounts host a variety of marine segmented worms called polychaetes. These polychaetes live on the sediment surface of the seamount floor, attached to rocks and even on and inside corals . . . they’re everywhere! After six days of our survey, we have successfully collected four beam trawls. With each catch a new diverse array of marine life is drawn up from the deep. We've seen fish, sharks, corals, squid, bivalves, crustaceans (including crabs, lobsters and shrimp), sea cucumbers and lots of sea urchins (in one trawl we estimated we caught more than 1000 sea urchins!). Happily for me we have also seen some polychaete worms in particular from the families Eunicidae, Syllidae, Aphroditidae and Polynoidae. My favourite catch so far was probably around 10 scale worms (Polynoidae) living on one piece of octocoral. The coral branches had grown around the worms forming tube like structures protecting the worms. The worm probably repays the favour by eating small debris and organisms that accumulate on the coral, cleaning the coral's surface and ensuring a healthy coral. I've also seen small polychaetes living in dead pieces of coral rubble (see image below). Tomorrow I will look at the worms in more detail using the microscopes on board and try to assign them scientific names. I'm also very excited to see what the next trawls will hold. Polychaetes are closely related to earthworms we find on land. These worms, sometimes as small as a human eyelash, are very abundant in marine sediments and are found from shallow waters right down to the depths of the deep sea. They are an essential component of the marine food web, a food source for other polychaetes, marine invertebrates, fish and wading birds. They play important roles in carbon cycling, eating up organic matter that has sunk to the seafloor and filtering out particulate matter from the water column. They act as bioturbators, burrowing through sediment, mixing up the sediment and introducing oxygen to deeper sediment layers via their burrows, allowing other organisms to inhabit these deeper layers. Seamounts are complex habitats, they include rocky ocean floor and soft sediments, different types of sediments (coarse or fine grained, stable or unstable), biological structures such as cold-water corals and sponges, diverse water current regimes. All these factors influence the types of polychaete worms living on the seamount. Previous studies on seamounts from the eastern Pacific have recorded numerous polychaete families. Researchers found that polychaetes from the family Sabellidae were particularly abundant on seamounts. Sabellidae worms are also known as ‘feather duster worms’, they have a crown of feeding appendages which radiates out from their head resembling a feather duster. Their tentacular crowns are important for gas exchange (polychaetes don’t have lungs). Sabellids wave their crown in the water column to "dust up" particles of food, seamounts are an excellent spot for this as there are frequent water currents circulating carrying nutritious food for the worms. Expeditions to the Tasmanian seamounts in 2008 and 2009 recorded polychaetes around 1600–2300 m water depth. Serpulid polychaetes were found attached to the tops of rocks and boulders. This group of polychaete secretes a calcareous tube which they often attach to hard surfaces, this could be a rock, seaweed or even the shell of a crab or mollusc (for more on serpulids see blog Mobile-home-building tubeworm known from Labrador and Madagascar also dwells in our deep sea). Seamounts are a perfect location for these worms as they are littered with rocks and boulders for serpulids to set up home. Polynoidae polychaetes were also recorded on Tasmanian seamounts, these worms are distinctive as they have a set of scales lining their backs. Polynoids can live commensally with other invertebrates such as sponges, deep-sea molluscs, limpets and sea stars and corals (as above). 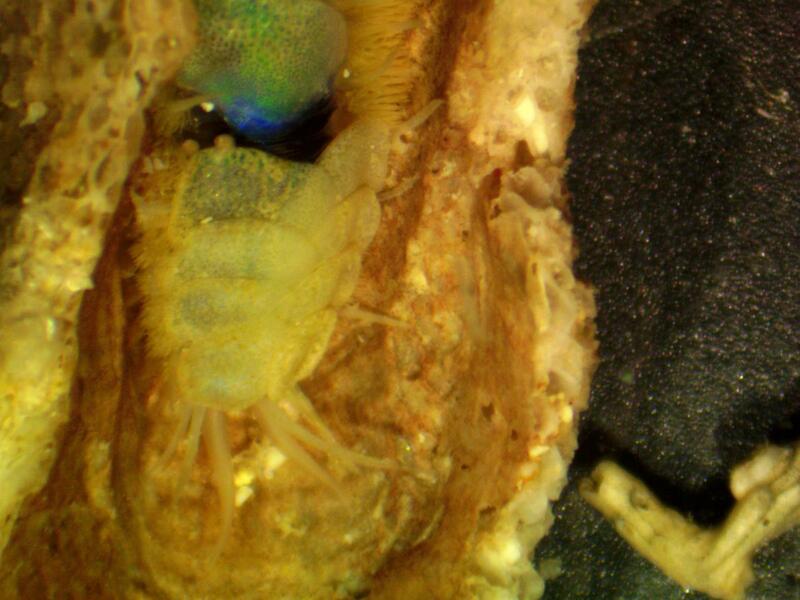 In this relationship the polynoid polychaete benefits as it gains a home and protection and the host organism is unaffected by the polychaete’s presence. On this expedition we are conducting scientific trawling and sled sampling to collect organisms living on the ocean floor (I’m hoping for lots more polychaetes!). The Tasmanian seamounts have been poorly sampled for small organisms living in and on the sediment, there is a good chance we will find new species of polychaete worm. Which species are found where on the Tasmanian seamounts? How do these species connect with other deep-sea species around Australia? These are the questions I’m hoping to answer with a little help from the polychaetes. Last night’s two kilometre deep-tow camera video transect went from the peak of Pedra seamount to its base. There were signs of previous fishing, especially close to the top, and a diversity of invertebrates including bamboo and black corals further down the flank. This completed the eighth transect on Pedra. Interpreting the impacts and recovery from fishing will be quite a challenge given the variation that we are observing between seamounts. The planned eight spatially-balanced transects per seamount will provide the best opportunity to distinguish natural variation from human impacts. 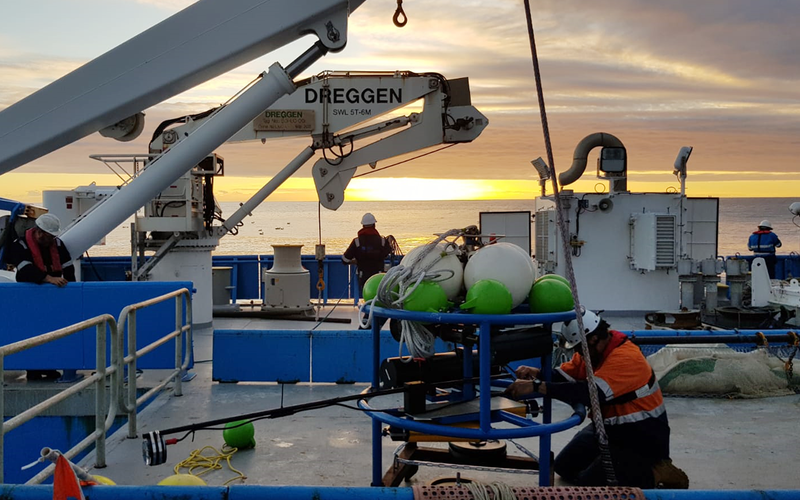 Over the next 12 hours we made maximum use of the deep-tow camera, completing a further transect on Hill Z1, four on the large Sisters seamount which has a history of fishing but now lies within the Huon Marine Park, and Hill K1. Sisters, which like Pedra peaks at quite a shallow depth, lacked the coral thickets around the top, whereas Hill K1 at a similar depth to Hill U had impressive coral thickets at the top with isolated patches seen down to almost 1500m. While the technicians worked on deploying our two deepwater Baited Remote Underwater Video systems (BRUVs), the ship was quiet in the water acting as a bird aggregation device in the calm weather, with up to 650 birds (about 450 of them albatrosses) settled on the water around the boat. Thirty-four marine bird species have now been seen on this voyage. The absence of wind means that the birds would have to put more energy into flying to soar over the waves, so it may make more energetic sense for them to rest on the water. There were many displays from the birds as they socialised – behaviours normally seen on land. Processing of the underwater video and stills has started. The imagery is processed in three ways. First the video is viewed and scored for major faunal groups. Second, the stereo video pairs are viewed side by side, and software used to identify an irregular quadrat that captures the area within focus and well lit. The size of this area is estimated (which is why we collect stereo pairs), and the number and cover of benthic animals within computed. Finally the software is used to lay down a rectangular quadrat on the image and all coral heads within that quadrat are counted. It’s a rather intensive process, but helps us get the maximum information out of the imagery. We are unlikely to come back to this area inside another 10 years so it is important to make the best use of what we can collect now.